List updated in previous post. PM's sent with final price, and payment details. CWC Longshot commission - 100% completed. Matt.Chopper, KingCam, Royal86 and boosted6 - your scopes are in stock now. I don't imagine I'll get to the post office before the end of the week though, and breeches won't be finished until Friday in any case. I will let you guys know a total cost including p&h later in the week, once I get days off. 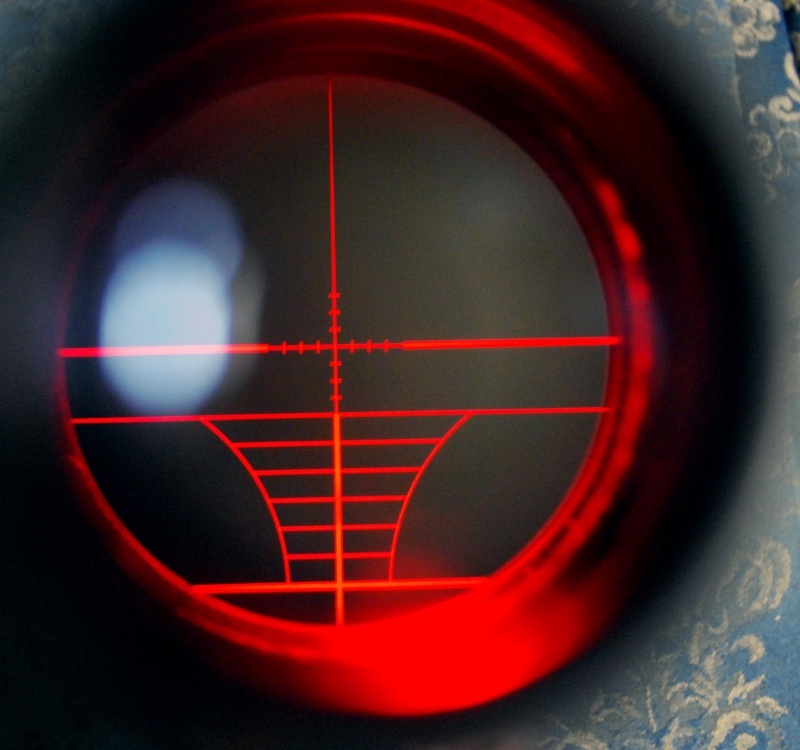 The Bushnell has configurable red and green crosshairs. I'll post up a pic once I get days off. Bushnell 3-9 x 40 scope. I've never come across a scope like this before, it was a little pricey for Nerf, but it will no doubt find it's way on to a firearm in the near future. Fricking heavy too!! Not the greatest of pic's, but the best I could handle on my own. Ohhhhhhhhh.... I should have ordered one. 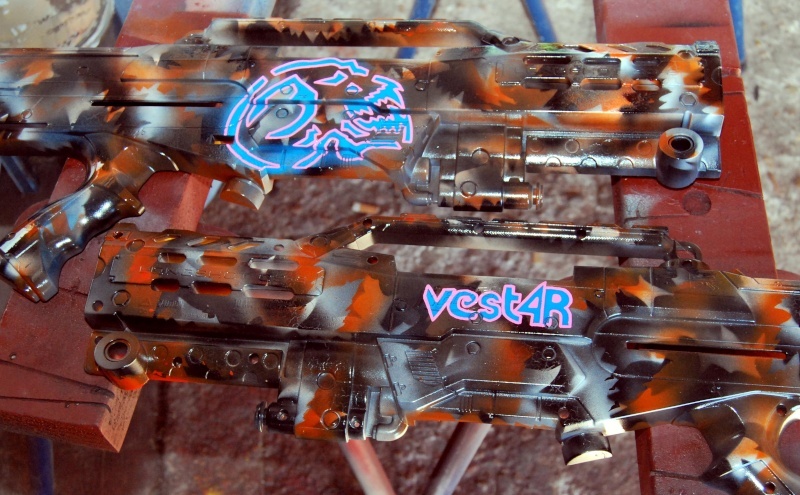 Not for nerf lol. This thing looks good enough for a real rifle. Yeh, it is mate, hence why I decided that the coin outlay wouldn't be too bad. I've got plenty of mates who shoot roo's professionally, and it was more of a trial so they could see how it goes. Bushnell is probably in the top 3 scope manufacturer's imo, and this unit is no different. Wow... nice scope. Actually pretty close to the one I originally was looking for. What's the pricetag on that beauty? What're the details/webpage of that one you found there, btw? 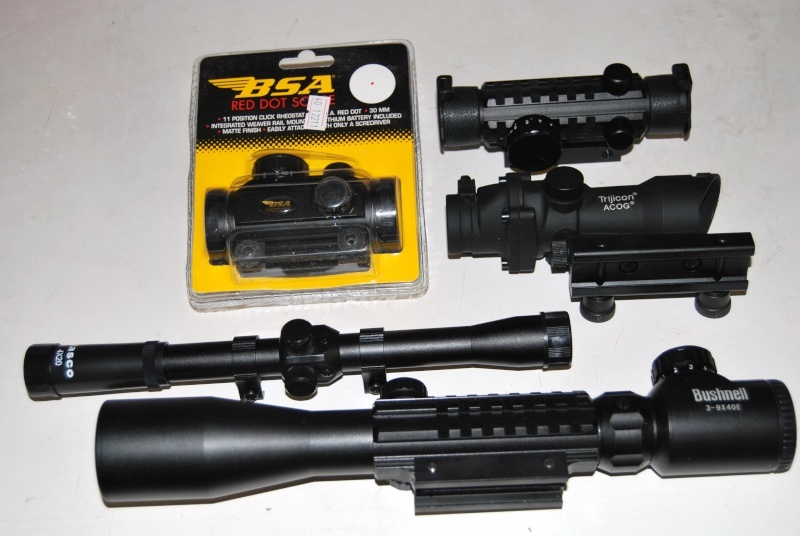 Ask around if anyone wants their commission to come with that red dot scope you've got for me, I'm happy to pay an extra handling fee of that one if there is a possibility of buying a zoom-lens cheap, I thought you couldn't get scopes with a zoom so cheap... Still happy to go with the red dot sight, but I've been searching like *crazy* for one with a crosshair and zoom, thought they were just unobtainable. Have a little extra cash post exam I can put away before I start going on a semester break drinking frenzy. Probably wise, to save my liver. I'll see what I can do. I presume you're talking about wanting the knock-off of the Bushnell? I'll get some details, but I really think weight is going to be an issue. I'll try to get the scope weight and dimensions for you, so you can make a decision based off of that. 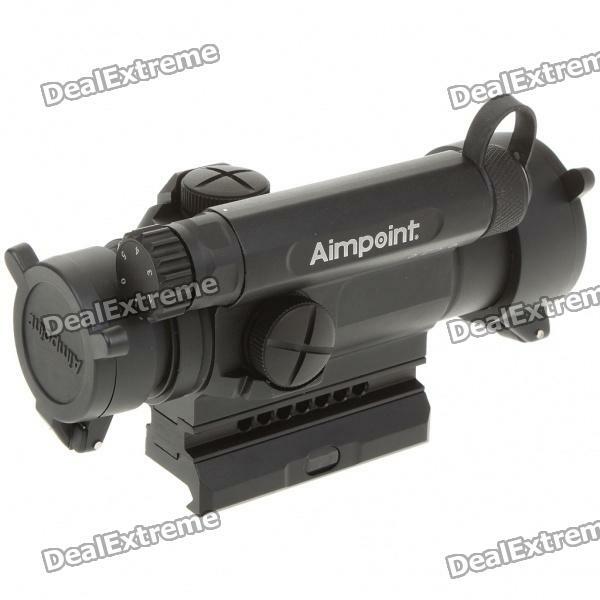 The aimpoint is from dx, but obviously, it isn't a zooming scope. Hmm, the weight of the blaster itself isn't an issue. Think there would be any issues with the sight-rail? Also, I'm not quite clear- do these scopes have zoom at all? The aimpoint scope from DX isn't a zoom scope. It would be a 0 or possibly a 1x magnification with an external red dot laser. Some of the other RD scopes I've got have 0 magnification as well, and the red dot is inside the scope (sort of like a holo sight). 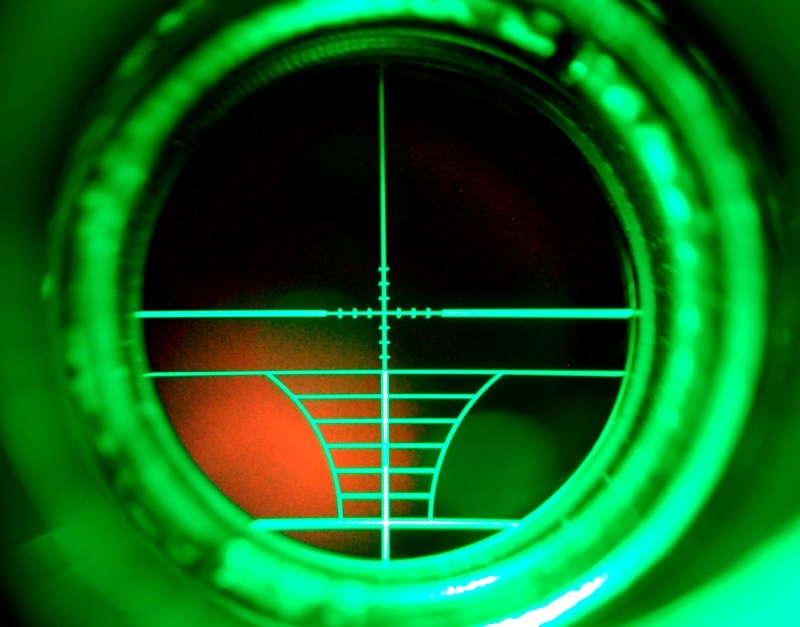 The Bushnell scope has both red and green internal diode's, which illuminate the cross-hairs of the scope. There's about 5 levels of brightness for each colour. It also has an object lens of 40mm, so it's quite big, and has a magnification of 3x - 9x. If the knock-offs are similar to the model I've got, weight is going to be a problem. Not for the tac-rail, but just for general movement. My Longshot already feels quite chunky with it on, and that's just mucking around with targets. Add the extra weight of a Stampede and the Raider drum, and it's going to feel a bit awkward. KW, could you send me a PM on here of fb and let me know what you think of the colour scheme. Unfortunately, there's not a lot of different shades of green available here, and this is probably as light as I can get it. Anyway, I'm sure we'll work something out. Clunk that is absolutely awesome! Stencil's aren't the best, but the cold weather's playing a bit of havoc with the rattle can's squirting, rather than fanning. CAN THOSE PEOPLE WITH OUTSTANDING PAYMENTS PLEASE CONTACT ME ASAP TO NOTIFY ME OF WHEN TO EXPECT THE COIN... OBVIOUSLY SENDING PM'S AND E-MAILS DOESN'T SEEM TO BE WORKING!! NB: Cody - you're fine mate, our original agreement still stands, as you're one of the few people who have been true to your word from day 1. Thanks mate. I've sent you a PM re postage cost's to 3021 not sure if you recieved it. Royal, been at work, and just got home. I have replied to your PM mate. Hey guys, I've had to go away unexpectedly for a day or two, so won't get to the post office until Monday. Guaranteed though, all item's will be posted on Monday. Thanks to BigW's online toy sale, I've acquired 2 x Stampede's and 5 x LongShot's for commissioning. If anyone is interested, send me a PM, and we can discuss options/pricing. Please note, I won't be starting any new commissions until the end of July, as I need to clear the current backlog of order's, plus, it would be nice to mod a blaster for myself one of these days... haha. 9 or 13kg spring upgrade. Improved return spring, o-ring and plunger seal, with plunger buffer pad. 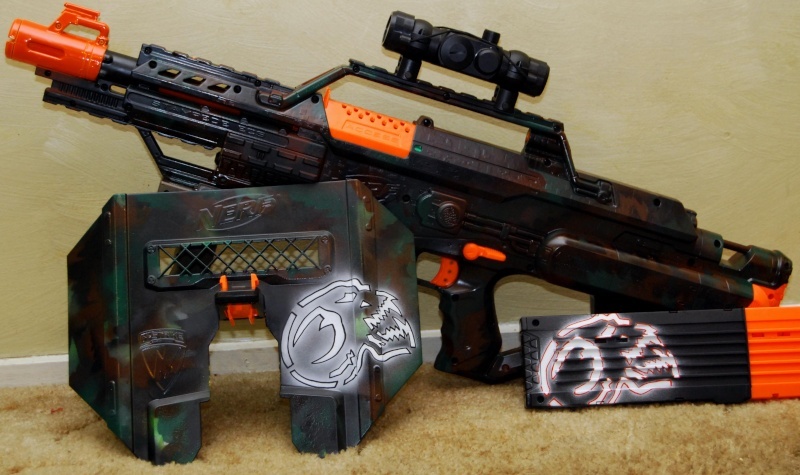 Painted Shield and bipod: $10 without skull on shield, $15 with skull. Painted clips (not drum): $15 without skull on clips, $25 with skull. 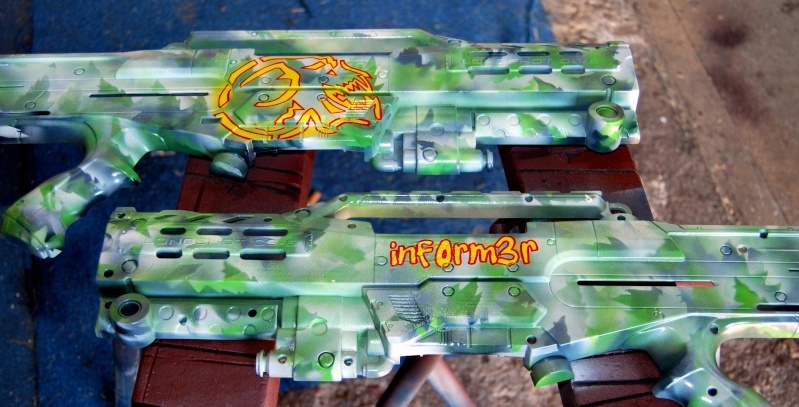 Clunk, I'm impressed with how fast you can do the paint job. It took my a few weeks just to paint one blaster (though I can only paint a few days per week due to work). Also you are probably the first person I heard of that can mod a Longshot, not talking about a singled Longshot but clip-feed, and shoot that 130 feet range at only 5 degree elevation angle. Thanks mate. I tend to spend a couple of hours most nights sanding shells. It takes me 4 hrs to prep a stampede for primer, and 5 hours or a bit longer for a Longshot. It also helps that I've got my stencil's pretty well sorted, stick to the one brand of primer and spray cans, and have a variety of rattle can nozzles. Lemme know if you got it .. its sitting in my Outbox for some reason, does that mean it's been sent I dunno? It will sit in your outbox until I've opened it mate. Just checked it now, and am working on sending you back a reply. Hey clunk, just got my package today :D. I should proberly just sell all my blasters now i got my pas and longshot.They are insane,my gf cant even prime the longshot. 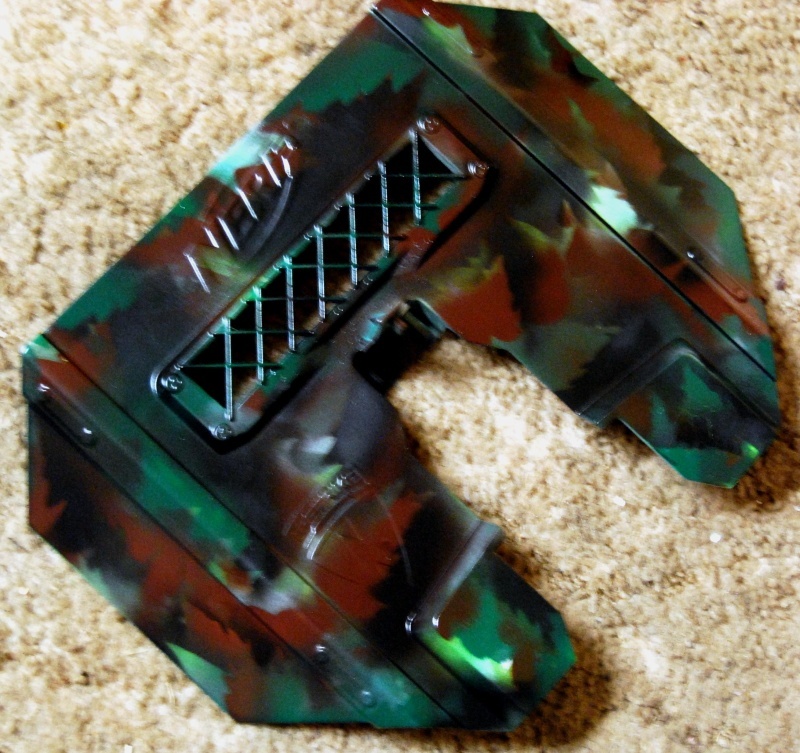 The work you put into your blasters is amazing and i am one VERY satisfied customer,if anyone is contemplating getting a blaster from clunk do it you wont be dissapointed. Glad to hear that you're happy with the products!! My RDS & LS Brass Breech came yesterday in the mail and I pay you for them just now. I heard you were pretty keen. I'll let you know tomorrow how it's looking, it's probably a good possibility, though I'd have to post Evan's separately, as it's a couple days behind in the manufacturing process as opposed to yours.